There has been a long-running argument about the trade union movement’s failure to engage with young people. Hence it is heartening, despite the obvious ups and downs, to note the development of a UNITE South West Young Members Committee. George Downs, one of its leading lights, sends this report. Ever since the Amicus/T&G merger in 2007, the engagement of young people in the union has been increasingly important. With youth unemployment sky-high; tuition fees trebled and the brutal policies of austerity being inflicted on services for young people, it has never been more vital for young people to join Unite and become active campaigners learning the skills necessary to stand up for their community. Young members can use their union as a vehicle to bring about social change and enrich their attributes which are fundamental for future employment. For those of us disillusioned by the Westminster establishment or politics in general, Unite can provide a fresh, exciting and grass-roots approach to political engagement and participation. 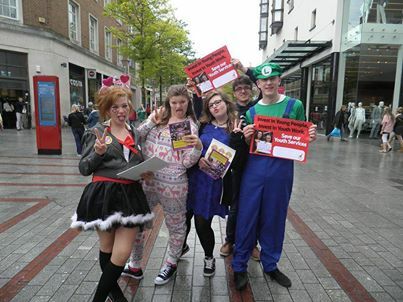 The industrial and community campaigns run by the Unite South West Young Members Committee allow young people to recognise that the political process is very relevant for the every-day issues in all of our lives. These include: Zero Hours Contracts; Living Wage; Mental Health; Bedroom Tax; Cuts to Youth Services; Pay Day Lenders/Unite Credit Union Service and Save the NHS. George’s observations pose the question of whether similar initiatives have taken place in other parts of the country. Further news and comments will be welcomed. Meanwhile we send best wishes to George and company in their quest to reinvigorate the group. Previous Facing the Future : Savage Capitalism – A System Beyond Reform?